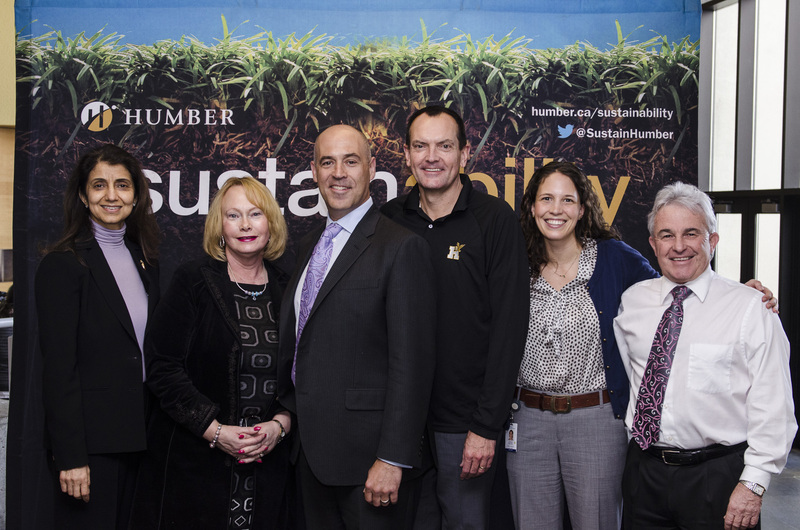 Humber is working hard to further sustainability across our campus. Our plans and reports help guide our actions. Humber Sustainability Plan 2014-2019 was developed through an 8-month consultation process, engaging over 5,000 students, faculty and staff. The Plan sets our measurable targets for key priorities such as energy and water reduction, social performance, learning and engagement. We use the Plan to guide the integration of sustainability throughout the college. Humber Sustainability Report 2014-2015 Released in Fall 2015, the Humber sustainability Report 2014-2015 outlines progress made during the first year of our 2014-2019 Sustainability Plan. Sustainability Report 2009-2012 Key accomplishments made prior to 2012 are summarized in this report. A case study, DECCS Case Study, is discussed within the report. DECCS stands for Distributed Energy Charging and Communications Station, and was a student-led collaboration to provide the Humber Arboretum and Centre for Urban Ecology with an outdoor wireless network and electronics charging station. In October 2016, Humber re-certified recertified with the Sustainability Tracking Assessment and Rating System (STARS) certification and achieved a Silver rating. The re-certification was done with the newest version 2.1 of STARS, the most robust to date. We have made great strides in campus sustainability since 2013 as the standards of most credits is higher now, we also increased our score by more than 13 credits. (click on the above titles to learn more about each of these amazing programs/initiatives we have at Humber! In August 2013 Humber achieved STARS Silver rating in the Sustainability Tracking, Assessment & Rating System (STARS). In September 2012, Humber College became a member of the Association for the Advancement of Sustainability in Higher Education (AASHE). We are committed to assessing our sustainability progress every three years with STARS, an internationally recognized campus sustainability benchmarking framework. STARS is a certification system specific to higher education institutions. We were the first college in Ontario and the third college in Canada to receive the STARS Silver rating. Read the news article. Many staff and faculty contribute a great deal of time and effort to help us report to the STARS certification every three years. We are truly grateful to everyone that helps us on this great accomplishment! Our AASHE membership applies to everyone at Humber! If you are a student, staff or faculty looking for member-only case studies or information in the AASHE Resource Center. You can simply create an account using your Humber email for full access to AASHE member resources. Questions? Contact AASHE Member Relations. Humber Sustainability highlighted in AASHE STARS 2014 Higher Education Sustainability Review on page 14! One of Canada's Greenest Employers 2016 and 2017. Humber College has been named one of Canada’s Greenest Employers two years in a row! Canada’s Greenest Employers competition recognizes Humber as an employer leading Canada’s culture of environmental awareness, and its ability to attract people with its earth-friendly initiatives. Humber celebrated the 2017 distinction at its North Campus on April 27 (video here). Featured guests included Dr. Chris Whitaker, President, Humber College; Gina Antonacci, Associate Vice-President, Academic; Spencer Wood, Director, Facilities Management; and Humber alumnus James Nowlan, Director, Air Policy and Climate Branch, Ontario Ministry of Environment and Climate Change. 2017 Smart Commute Employer of the Year – City of Toronto & GTHA winner. Humber College was named Smart Commute’s 2017 Employer of the Year for the City of Toronto and the Greater Toronto and Hamilton Area. These two awards demonstrate Humber’s commitment to sustainable travel. Not only do over half our students commute using public transit, campuses have seen an increase in bicycle and electric vehicle infrastructure. This adds to our Smart Commute Gold Workplace 2015 and 2016 distinctions for encouraging single-passenger vehicle alternatives. Find out more about sustainable transportation at Humber College here. Humber is a signatory of the Association of Canadian Community Colleges (ACCC) Pan-Canadian Protocol for Sustainability. Signatories to the Protocol agree to provide leadership in their internal and external communities and to maximize their contribution to a sustainable future.